I have a long-time habit of coming late to television shows. 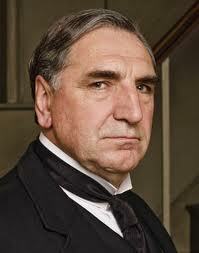 Recently, I began watching both BREAKING BAD and DOWNTON ABBEY. I can’t imagine two shows more wildly different yet I find them both quite compelling (and sometimes imagine Carson the butler cooking meth in the servants’ quarters). Me enjoying a violent contemporary program and a feel-good period piece might indicate a split personality, but the truth is, I have about as much admiration and respect for the British aristocracy as meth cookers/dealers; neither would make my birthday party list. However, I’ve grown fond of these characters (although, In the case of DOWNTON ABBEY, I’m much more invested in the servants than the pampered, with the exception of Maggie Smith’s Dowager Countess who is a rude delight). I jumped into DOWNTON ABBEY in season three, and have had no real difficulty easing into the characters’ lives and their story lines. While I wouldn’t want to spend time with any of the aristocracy, it’s not a huge stretch for me to (mostly) root for them or, at least, not wish them any ill will. BREAKING BAD is a whole other premise. I’m watching it from the start (am halfway through season two), and am so glad I went back to the beginning. The writers do a phenomenal job making me care about those characters. 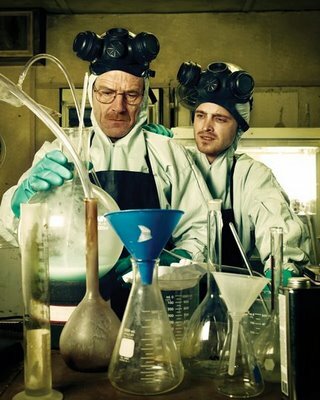 I could easily loathe Walter and Jesse if I hadn’t gotten glimpses of their lives before they broke out the beakers and masks. But not only do I not loathe them, I root for them. As in, last night I caught myself being glad for them as I watched sale after street sale of their crystal meth. Whoa. At the same time, Walt’s character is becoming less and less sympathetic (and I’m so glad Skyler is giving him a taste of his own attitude! ), but there’s no way I’ll stop watching. And from the rave reviews, no one else stopped, either. DOWNTON ABBEY, on the other hand, has pissed off plenty of viewers by killing off the second major character of the season and may well slip in the ratings. What does it all mean? Hell if I know. I’m just filtering everything through my writerly perspective while pondering how to apply these same can’t-turn-it-off principles to my own storytelling.